Weeks after confirming the channel would not appear on Freesat because of the platform's inability to "encrypt content for UK transmission only", London Live has confirmed on Twitter that it will be broadcasting free-to-air on satellite. Should the channel actually go free-to-air on satellite, then it should be available on most Freesat receivers in "non-Freesat mode", and still be available in neighbouring countries, contradicting the broadcaster's earlier statement. Both Sky and Freesat channels use the same satellites - typically either Astra 1N (soon to be replaced by 2E), Astra 2F, Astra 2A or Eutelsat 28A. These satellites are located at the 28 degrees East orbital position. 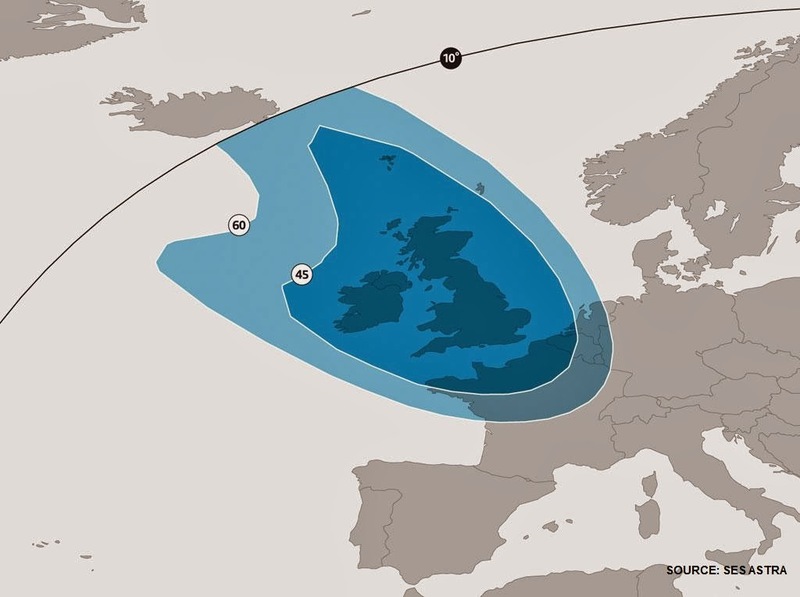 Area covered by SES-Astra pan-Europe beam. 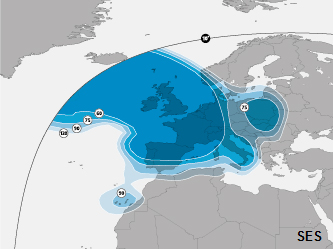 Eutelsat 28A has a broader coverage area. The UK spot beam is still receivable with a mini dish in the Republic of Ireland, The Netherlands and Belgium, regardless of whether the channel is available on Sky, Sky and Freesat or just Freesat. Dutch operator Canal Digitaal offers viewers in the Netherlands a special "triple sat" set-up to benefit from the UK free-to-air TV overspill signal, enabling viewers to watch UK TV, regardless of what distribution arrangements a broadcaster has made with either Sky or Freesat for UK reception. Overspill from satellite into other countries has to be taken into account when negotiating broadcasting rights. Therefore, most free-to-air channels who want to reduce the cost of obtaining rights will opt for transmission on the UK spot beam. So signing up for Sky and not Freesat and still being free-to-air still means that the signal can be received outside of its intended service area, including outside of the UK. The ability to freely access free-to-air TV channels, even if the viewer is not in the country of origin is legal under EU legislation. All this invalidates London Live's earlier statement on Twitter, that stated "We are only 'allowed' to be viewed within the UK as part of our operating regulations. As Freesat can't encrypt content for UK transmission only, you won't be able to watch London Live on their platform." The only way in which a channel could currently ensure that its signal was restricted outside of the UK is by transmitting it as a "free-to-view" channel, rather than "free-to-air". "Free-to-view" channels only exist on Sky. A channel that is "free-to-view" is in effect a free channel available to viewers with a Sky box and a smartcard, regardless of their level of subscription. The smartcard inserted into the Sky digibox enables access to these channels at no extra cost. Originally, the UK's main terrestrial channels launched on satellite using this technology, as the first satellites carrying Sky Digital in the late 1990s all had pan-European beams. The BBC would have had to have acquired expensive Europe-wide sports and movie rights, or block programmes on satellite had it been free-to-air at that time. When the first satellite with UK spot beam capacity came on board, a switch from free-to-view to free-to-air became possible. Whether the team at London Live actually mean they are going "free-to-view" and not "free-to-air" is yet to be confirmed. The difference is crucial for viewers without a Sky smartcard. Both Freesat and Sky have systems in place whereby depending on the postcode of the viewer, the relevant regional channels are supplied in the Electronic Programme Guide (EPG). Such a system will mean that London Live will only appear on Sky channel 117 in London. However, if the channel is actually broadcast as a free-to-air channel, then it is likely to be possible to be added by Sky users through the "other channels" menu, if the channel's satellite transponder details are known to the user, and if the channel is broadcast via a transponder with standard parameter settings. There's no need to broadcast one version of the channel for Sky and one for Freesat. Channels that appear on both platforms carry two sets of data with their satellite signal - one set for Sky and one set for Freesat. The data is added in Sky's Adaptation Hub before uplink. Sky boxes will process the Sky data and allow the channel to be found on its designated Sky channel number. Freesat boxes will process the Freesat data and allow the channel to be found on its designated Freesat channel number. If a free-to-air channel has only signed up for carriage on Sky's EPG, then only one set of data needs to be transmitted. Sky boxes will receive the channel and put it on its designated channel number. Freesat boxes can still access the channel in "non-Freesat mode", whereby because the channel is not carried on Freesat's EPG, it has to be manually found and stored on the receiver. The same is true of "generic" free-to-air satellite receivers. This workaround for Freesat viewers will apply if London Live does launch as a free-to-air channel. As many more local TV channels - particularly the larger ones - consider broadcasting on satellite, the matter of which platforms they broadcast on will become very relevant. Freesat, with around 2.1 million viewers (Ofcom data from April 2013) is a small, but very significant platform to be considered. Ultimately, if a channel decides to go free-to-air, don't blame overspill reception outside of the UK for not being on Freesat. 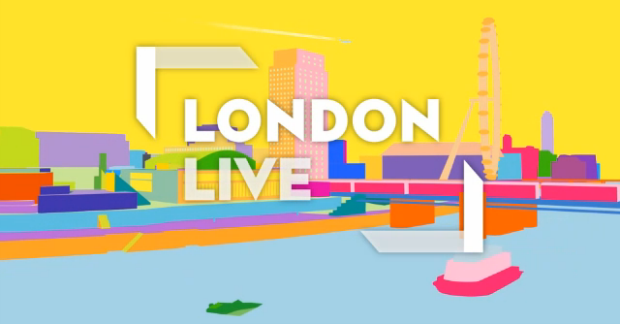 London Live launches on 31st March on Freeview channel 8, Sky channel 117 and Virgin 159 for viewers in London. 27/01/2014: London Live is testing on satellite (freq: 12610V, service ID: 50892) but encrypted.